MONTREAL, Oct. 10, 2018 — Osisko Metals Incorporated (the “Company” or “Osisko Metals”) (TSX-V: OM; FRANKFURT: 0B51) is pleased to announce that it has joined forces with Osisko Gold Royalties Ltd and Osisko Mining Inc. to create the Osisko Field Education Fund for the Earth Sciences Department at the University of New Brunswick (“UNB”), and together have donated $250,000 to the It Begins Here campaign, the largest fundraising effort ever undertaken by UNB. 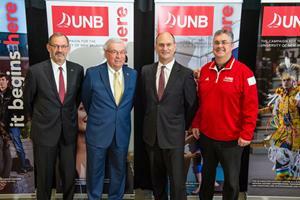 Together alongside alumni, students, faculty, staff and corporate and community members, UNB surpassed its $110 million goal by raising $125 million dollars. The momentous fundraising campaign was dedicated to ensuring that students have the financial support they need to obtain a quality university education. This is a transformational event for the university. The Osisko Field Education Fund is an effort that will yield a direct benefit to students within the Earth Sciences program, helping to reduce the cost of UNB’s stratigraphy and geological mapping field school courses. The courses will therefore become more accessible while supporting the university’s high standard of excellence in Earth Sciences. The Company would like to address an arithmetical error within its press release dated October 9, 2018. Hole EM-18-PP-152 should have read, “intersected 4.22% Zinc and 2.56% Lead (6.78% Zinc + Lead) over 8.20 metres”.